Tristan Pigott's paintings strike a very modern nerve; his heroes and heroines are resolutely everyday and wonderfully banal - but they're also magical and loveable and larger-than-life, full of colour and spirit and backed up with a healthy dash of the absurd. In his Hoxton studio, which doubles up as his home, there's a little yellow budgie chirruping away as he moves around a maze of new paintings, works in progress for his upcoming show. "I'm always inviting people round," Tristan states. "The paintings they really need to be seen in the flesh. The colours and size get lost on a screen… generally though it's always an interesting reflection of someone's personality in how they read a painting." 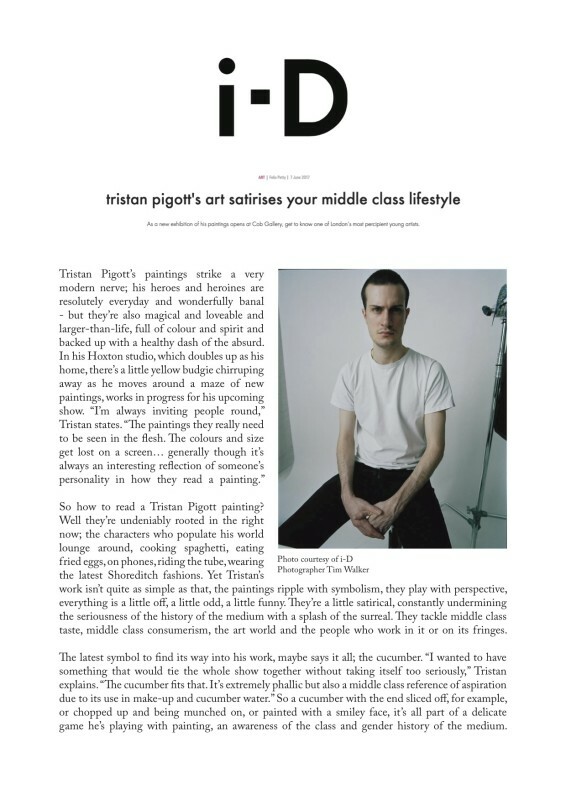 So how to read a Tristan Pigott painting? Well they're undeniably rooted in the right now; the characters who populate his world lounge around, cooking spaghetti, eating fried eggs, on phones, riding the tube, wearing the latest Shoreditch fashions. Yet Tristan's work isn't quite as simple as that, the paintings ripple with symbolism, they play with perspective, everything is a little off, a little odd, a little funny. They're a little satirical, constantly undermining the seriousness of the history of the medium with a splash of the surreal. They tackle middle class taste, middle class consumerism, the art world and the people who work in it or on its fringes. The latest symbol to find its way into his work, maybe says it all; the cucumber. "I wanted to have something that would tie the whole show together without taking itself too seriously," Tristan explains. "The cucumber fits that. It's extremely phallic but also a middle class reference of aspiration due to its use in make-up and cucumber water." So a cucumber with the end sliced off, for example, or chopped up and being munched on, or painted with a smiley face, it's all part of a delicate game he's playing with painting, an awareness of the class and gender history of the medium.